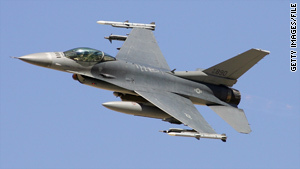 F-16s were dispatched for the second time in two days because of an unruly passenger on a U.S. domestic flight. (CNN) -- In the second such incident in three days, fighter jets escorted a diverted commercial flight on Friday after an unruly passenger caused alarm onboard. The flight, bound for San Francisco, California, left Atlanta, Georgia, at 9:48 a.m. ET, according to AirTran's Web site. NORAD dispatched the fighters at 1:44 p.m. ET, escorting the aircraft to a safe emergency landing in Colorado Springs, Colorado, officials said. The passenger was detained there and FBI agents from Denver, Colorado, were called to question passengers, Hutcheson said. The other passengers were scheduled to continue their trip at 4:30 p.m. ET, he said. On Wednesday, NORAD escorted a Hawaii-bound plane back to its origination city of Portland, Oregon, after a passenger gave a flight attendant a note that was interpreted as being threatening, the federal complaint and supporting affidavit said Friday.